As you may know, yesterday saw the recording of an exclusive new podcast for all you Millennium fans courtesy of James, Troy and BacktoFrankBlack.com but aside from the fun and the folics this campaign does have a mandate and that is where you come in. One question we get asked a lot is "what can I do to help bring Frank and Millennium back?" We must confess, through this busy year the core BTFB team haven't headed out to th e horror/sci-fi cons, but again, this is something we'd love to see people do: going to conventions and chatting about Millennium. Thanks to M.R. Sellars and Benjamin J. Szumskyj we know hundreds of flyers have already been distributed amongst convention goers! If you fancy doing the same don't be afraid to take flyers with you to a convention or merely wag that tongue and tell people what's going on. Tell them about BacktoFrankBlack, tell them how Lance is keen to come back in the roll. And of course, let us know you're doing it! The more feedback we get back from you guys, the more we can use to promote ourselves! Show us you are spreading the word at the cons, and we can then tell industry/media contacts that is what you merry people are doing! Want to voice your opinion on our blog? Email me at mark@backtofrankblack.com for the opportunity! Post about us on your blogs, put us in your signatures, tell the internet all about us! 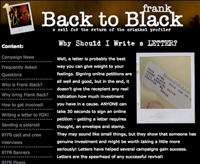 We have a load of banners and icons for you to download and even some wallpapers and avatars to help give you that BacktoFrankBlack identity you've always wanted! Don't be afraid to tell us what you think. You may notice the DVD links on the blog and website. These are there because someone recommended we did it, so we did. We appreciate feedback. Contact us on info@backtofrankblack.com or if you want to speak to me mark@backtofrankblack.com. You can help us shape YOUR campaign. Because in the end, this campaign is for the fans. We have more stuff planned: big interviews, interactive events, giveaways and more so bookmark us, talk to us, and let's really work together to bring Frank Black back! 0 Responses to "...BUT SERIOUSLY!"